Basic ingredients: Each class at this Northern Irish Ballymaloe is formed of 12 pupils and aims to give them the confidence to do something different with food using practical advice and guidance. The school has hi-tech workstations overlooking Lough Erne and offers four-week diploma courses, weekend and long weekend courses and day courses. Full-day courses, such as Deli Days and 20 Minute Suppers, cost £130 each. They say: We want our cooks to find natural flair where once lay only a fear of grams and ounces. 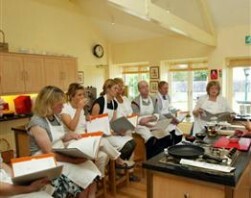 We say: Based in the eponymous castle, this is the only residential cookery school in Northern Ireland. Stay over in Belle Isle Castle, apartments in the Courtyard or in one of three pretty cottages on the estate.